Shreveport's Farmers' Market now has a MySpace page. It gives market manager Noma Fowler-Sandlin a platform to keep local foodies informed. "I'd love for everyone to friend the market so you'll always know what's going on. I'll send out bulletins twice a week so you'll know what's happening that day," said Noma. You can even listen to the nifty song Down the Red River Again by Louisiana Dan (he'll be performing at the market June 3). The market opens at 7 am tomorrow at the Festival Plaza pavilion, 101 Crockett St., between Spring and Commerce streets. Blogs, MySpace pages and Facebooks are no cost ways for organizations and artists to create a web presence. Not only are they free but also easily maintained. If you have enough computer skills to send emails, you can blog. No need to wait for a webmaster to slap your freshest info into the Internet. Once a page is created it's a snap to link with interesting places to get publicity. For instance, a visitor to the Shreveport Bossier Fun Guide would be able click through to a page with pertinent information about the organization or artist sponsoring a listed event. Guest Editor's note: Mr. Trudeau is recovering nicely after his Tuesday morning heart surgery. Keep those cards, letters, texts, and emails coming. Most importantly, get out and enjoy SB Land this weekend! Gotta love the pinked out site that is moviesauce.org. Click through then try to halt your flip flops from flapping to Robinson Film Center this Friday and Saturday. Hunter Carter and Evan Falbaum created the film festival in 2005. To chart its evolution just frisk this blog. Tickets remain affordable. $7 a program or $30 for the entire affair (5 whole programs). Guest Editor's note: Since I'm at the helm while Trudeau sculls along on a delicate internal adventure, I will add how super modern SB Land would be if everyone upgraded their texting plans so festival goers could twitter.com their way through. Interactive film goers? Watch out SXSW. On the other hand this opens for discussion -- is it rude to text during a flick? The John Adams Trio, based in Dallas, Texas, will present a How to Listen to Jazz workshop before their Barnwell concert begins at 6:00 pm, Thurs, May 29, says Freda Powell. The interactive workshop is scheduled from 2 - 4 and is open to the public. “This is a great opportunity for the many jazz enthusiasts in the area to gain a greater appreciation for jazz,” said Freda Powell, Barnwell executive director. “The workshop is interactive; musicians attending are encouraged to bring their instruments to participate in the demo." 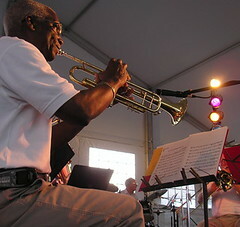 Admission to the Barnwell Center and “Hot Jazz on the Red” is free. The Barnwell Center is adjacent to Riverview Park and next to Eldorado Resort Casino. Parking is free in the Eldorado Garage; I've never had an untoward experience there. "As an accomplished acoustic and electric bassist, John Adams is one of the Southwest's most versatile and in-demand jazz, pop, and studio musicians," says his agency. Adams served as Music Director and performed weekly for three and a half years at Dallas' prestigious Crescent Court Hotel. 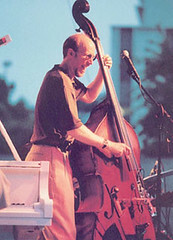 Adams holds Bachelor and Master of Music degrees from the University of North Texas, where for ten years he was the jazz bass professor. He is also active as a producer/arranger, a composer, clinician, and an instructional author. Listen to his trio here. Deborah Demaree has known about her cancer for 3 months, says the Times. 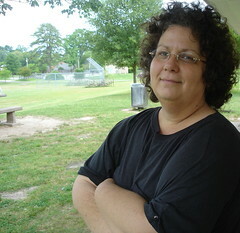 The former Debbie Harold, she is mother to Ashley Hazelton and Micah Harold. 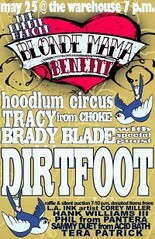 Matt Hazelton and Dirtfoot have organized a benefit for her to be held at the Warehouse Sun, May 25, 7 pm until midnight. Funds will go toward her medical and living expenses. “The whole state of Louisiana really is a museum,” Lt Gov Mitch Landrieu tells NY Times writer Ron Stodghill in an article on the new African-American Heritage Trail (May 25 Travel). Louisiana's Af-Am Heritage Trail includes 26-sites. What's featured in Shreveport? Click on the Trail map's blue squares and you will be entertained by Lou Gossett, Jr, as he offers brief history lessons that relate to the MultiCultural Center of the South and the Southern Museum of Art Shreveport. 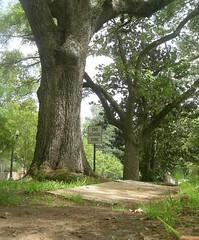 The Calanthean Temple and dance halls of Texas Ave are not included in the Trail. There is room for enormous growth over the coming decades in what's featured in this fascinating program. Macondo is a shop that is well-stocked with the natural fiber and bead products of Ecuador. It lies, hidden if in full view, at the corner of Youree and Ockley. Inside we recently found voluble shop owner Janine Demerath and beaming daughter, Rafaela. Demerath is a native of Ecuador. Macondo is, she says, "my mini Ecuador. It represents my country in my heart." 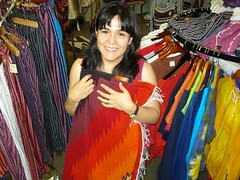 She notes that the goods reflect other Latino countries, too, such as Peru and Mexico. Macondo is a crossroads for those who love Hispanic culture. The performing arts group Voces Castellanos (see earlier Shreveport Blog posts) meets here, she says. The shop's name is taken from the novel One Hundred Years of Solitude, the work by Gabriel Garcia Marquez. Macondo is a fictional town that represents the villages in which Marquez was raised; the book stands as a metaphor for the history of Latin America. Demerath, a teacher of Spanish for Centenary College and Hispanic storyteller for the Louisiana Endowment of the Humanities program, Prime Time, has 2 children, Rafaela and Gus. Her husband, Loren, is professor of sociology at Centenary and a community activist. Please see A Better Shreveport. Jewelry, flowing dresses, caps, T-shirts: the shop has a wide assortment of goods. It is open 3 pm to 6 pm and can be accessed, even when Demerath is out of pocket, by asking for help at The Mattress Shop, which shares a portal. 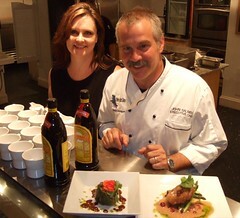 Please see photos from a visit to Macondo at Shreveport Faces. Chris Jay, the media maitre 'd for the RFC, says, "Our new website is live. It's obviously a Beta version, we're working out lots of kinks, but it's live and it functions." Karpeles Museum's Jean Glabus says, "There will be 10 pipers competing for sure; also: fine music, good food & great company." The event is called Ceol na Pioba, "Music of the bagpipes." The date is Sat, May 24, 9 am to 7 pm. NY Times profiles Shreveport: "Son of a gun, Hollywood has big fun on the Bayou"
The NY Times opens with: "There is a backlot feel to Shreveport, tucked in “Ark-La-Tex,” the nexus of three states where the piney woods encircle sloughs and bayous. Its post-boom downtown — the oil and gas petered out in the mid-1980s — has plenty of fine old buildings, not many people and, along with a bit of dissipation, an air of expectation, as if the circus might suddenly crest a hill and bring all manner of hoopla. " NY Times writer David Carr has profiled the city and the work we do. It is witty, frank and a useful mirror for our purview. Sara Herrington, an articulate woman with a solid track record of community service, invites the public to the Metropolitan Planning Commission public meet Wed afternoon, 5:30 pm, at 505 Travis St (ground floor), aka Govt Plaza Chamber. 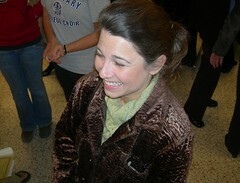 Herrington is one of the nine members of the Planning Commission. Also involved are a seven-person MPC staff and the 12-person Caddo Parish Commission. See all those names and phone numbers at the www.csi.shreveport.la.us site. If you are like the A Better Shreveport coalition and the artists I know and appreciate, it is to your advantage to be there. For a long time such planning has been guided by the pressures brought to bear by vested interest parties such as real estate investors. Today, we can try to head off such distortions by being visible. Kathryn Usher sent this message yesterday: "I have a friend who lives in Highland. 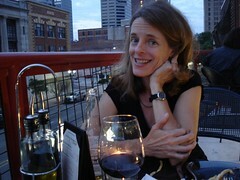 She is a new resident of SB Land with "dual" residency in Shreveport and Austin. She came up with this slogan tonight: 'Shreveport - Affordable Austin.'" That slogan, brilliant - if over the top, is what will drive my participation. Property owners and residents of Highland may submit an application outlining plans for significant, highly visible home improvements to their property in hopes of getting one of 10 grants of $500, says HAP. Among other things, judges will consider overall benefit to the neighborhood and prior improvements to the property(s). Deadline for submission is June 10. Applicants must agree to complete their work and submit receipts no later than August 15. 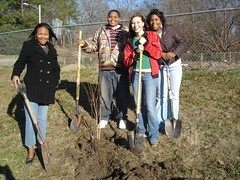 Applications may be obtained at www.highlandareapartnership.org, at the HAP office located at 106 East Kings Highway (Centenary Square, Centenary College campus) or at Lila’s Cakes and Chocolates at 440 Olive Street. The contest was created in 1996 as part of HAP’s mission to aid in revitalization of Shreveport’s historic Highland neighborhood. In the 12 years since, the organization has distributed 81 awards totaling more than $40,000. The awards have helped with everything from landscape to major repairs. The organizers have noticed a change in the type and scope of the projects since then. “In the beginning, we had requests for general maintenance. Now, we have people wishing to complete large scale change,” said HAP Committee Chair Kenneth Koonce. 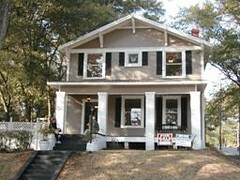 The organization attributes this to fact that people are rediscovering the charm of historic Highland. “We have it all! Charming, well-built homes with established landscape, trendy boutiques and delicious restaurants are right around the corner. 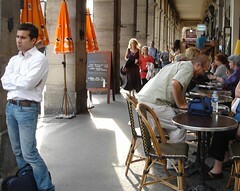 Plus, you have a safe, friendly, and pedestrian-oriented area,” Koonce added. Recent changes in grants have meant the loss of funding for administrative staff. Executive Director Dorothy McDonald has resigned, but plans to remain active as a HAP member and volunteer. In a bold letter to the editorial page of the Shreveport Times, orchestra leaders Peter Haas and Chan Teague have called for replacement of the orchestra's board and administration. They assert, "We agree with SSO board members Libby Siskron and Berte Muslow that the SSO belongs to the community and should expand its visibility and donor base, and further, expand board governance deeper into the Shreveport-Bossier City community. The SSO should not be reserved as a social outlet for a few but rather a cultural resource for all and supported by many — inclusive rather than exclusive." I personally hereby volunteer to return to the board. Those who want to forge a new spirit in an old town need to take this opportunity to volunteer their labor alongside me. My commitment to fund raising would be in phoning a long list of donors. I've done this work before and had some success. I've also felt burned out on it; yet it is time to do it again. 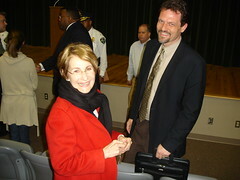 When I first moved to Shreveport one of the SSO"s top ticket sellers, the late Mrs. Dr. Sherman Gorton, called each year. She made sure, in a diplomatic way, that I remained in the fold of the ticket holders. That direct contact by a local personality made an unforgettable difference to me. Yet board members need to have much deeper pockets than me, since my bread-and-butter is being a Caddo teacher. That means new board members should know that a large personal contribution needs to made right now. One of my priorities would be making a special appeal for leadership from the African-American half of the city. There lies an enormous amount of brainpower and financial support. Also, the growth in the Asian and Hispanic communities in the region have made it imperative that Asian and Hispanic money and insight are part of the symphony's leadership group. New board members and new solicitations need to be activated post haste. The afterglow of the successful Constellation Ball and Picnic Pops concert is a leverage that can be used for good if we are quick-footed. Mark Twain's classic story comes to musical life, says Peter Pan Players director Trey Jackson, in this Broadway adaptation of America's favorite book. Set in 1840's St. Petersburg, Mo., Tom Sawyer matches wits with his stern Aunt Polly and bratty half-brother Sid, falls in love with the feisty Becky Thatcher and goes on the adventure of a lifetime with Becky and that irresistible renegade, Huckleberry Finn, while trying to fend off the villainous Injun Joe. Filled with foot-stomping, toe-tapping songs by Don Schlitz ("The Gambler"), and a warm, funny book by Ken Ludwig ("Lend Me A Tenor"), The Adventures Of Tom Sawyer is a tale of thrilling escapes, comedy and inspiration for the whole family. 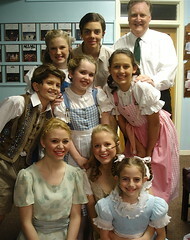 Peter Pan Players is online with a PPP blog and their own Myspace. Brady Blade, Jr, is going to be selling the city of Shreveport to businesses alongside Mayor Cedric Glover and Rick Seaton. I cannot imagine a better situation for the city. Having known him since his high school years at Caddo Magnet High, I believe him a fellow of impeccable honesty and reliability. He is a graduate of Centenary College. His personality is magnetic. He was born with a golden smile and laugh. When Brady, Jr, enters a room, the vibe goes up 2 or 3 notches. As a drummer has won spots with EmmyLou Harris, Steve Earle, Jewel and the Indigo Girls. I remember seeing him on Saturday Night Live a few years ago when he handled the kit for Dave Matthews & Friends. He has also swum with the sharks in the record industry's production offices. He has managed artists and repertoire (an "A&R man," when things were good for record companies), and run his own company, Brick Top Recordings, LLc. He has opened an internet-based musicians' enterprise along with Dr. Kirk Labor, former Shreveporter, says wikipedia.org. Brady is an extremely well-spoken fellow whose global travel will serve well in economic development. 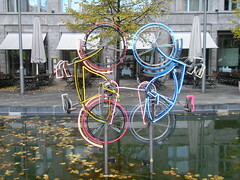 In recent years he has resided in Stockholm, Sweden. There's his acclaimed family to consider , too: Blade's father, Pastor Brady Blade of Zion Baptist Church, is a community leader. His brother Brian is a also a drummer, one in the highest ranks of jazz music. Blade's artist-businessman profile is highly appropriate for a striving Bayou State city. Whether in tourism, digital services or entertainment-related activities, having Blade aboard will certainly put Shreveport ahead. The new manager of Shreveport Farmer's Market is Noma Fowler-Sandlin. She has been a vendor at the market for several years; her shop is Pan's Pantry jellies and jams. If anyone can add energy to this lovely downtown event, it's this artist-arts producer-crafts person. Noma says the summer of 08 offerings are multifarious. Shreveport’s Farmers’ Market provides a place for some 60 vendors every Tuesday and Saturday from May 31st, 2008 to August 30, 2008. Operating hours are from 7:00 a.m. to noon on Saturdays, and from 4 p.m. to 7 p.m. at the Tuesday "happy hour" market, featuring a cash bar and musical entertainment. The first Saturday of each month will feature a visit from Lifeshare Blood Centers where patrons may donate to their worthy cause, and live bluegrass music from The Blanchard Jammers. Farmers and artisans sell local produce, herbs, plants and fresh cut flowers, canned goods, honey, and baked goods. Other treats include gourmet dog treats, and arts and craft items, such as homemade soaps, jewelry and various items. Some vendors are state approved to accept Farmers’ Market Nutrition Program Coupons for seniors. Our market is family-friendly and we encourage you to come back every week because the produce, plants, and specialties will change as different fruits and vegetables reach their peak of freshness and taste. Opening Day of the Shreveport Farmers Market will provide a full house of vendors selling fresh produce, beef, sausage and shrimp, home-made goods of all sorts, and arts/crafts. Additionally, Blanchard Jammers will provide bluegrass music, and the blood mobile from Life Share Blood Centers will be on hand to accept life-saving donations. Shreveport, poised on the edge of more-than-average growth, is eyeballing the future instead of pretending it won't happen. The Metropolitan Planning Commission has developed a 25-page plan for the coming years. Now it needs citizens' input. The meeting at 5:30 pm on Wed, May 21, is a public hearing, the first of three, on the master plan. It will be held at Govt Plaza, 1st floor, 505 Travis St. If you cannot attend, you may write down your ideas and concerns and send them to Charles Kirkland, 505 Travis St, Spt 71101. Kirkland is at 318-673-6474. A no charge Bike Workshop at Uptown Shopping Center parking lot will take place Sun, May 18, from 1:30 to 4:30, says Sally Spruiell. The idea is to help you get your bikes out of the garage and get them pumped up and in gear for riding, says Ian Webb. - Trained bicycle mechanics from River City Cycling on hand to inflate tubes, check brakes and gears, perform safety checks, and get your bikes ready to ride for the summer. 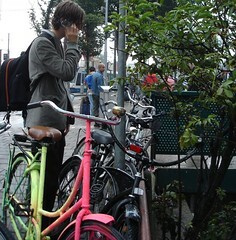 - Experts on hand to discuss riding your bike for every day errands like shopping and commuting to work or school. - The Shreveport Police Department Mounted Patrol there to talk about safety, cycling and the law. - Displays of products to help you reduce your dependence on your car and help you get into shape by comfortably using your bike more. The Political Action Council for Equality, aka PACE, presents the Third Annual Gay Pride Dinner on Sat, June 7, says Adrienne Critcher.It will be held at Ralph & Kacoo's, 1700 Old Minden Road, Bossier City. 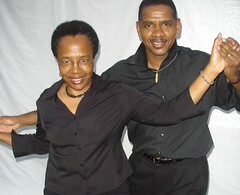 Adult swing and line dance workout classes will be taught by the incomparable and irrepressible Jerry and Tarama Davenport on Mondays at Pamoja Art Society, says Tarama. The classes will go from 7 to 8 pm, but will not begin for a while due to water damage suffered at Pamoja during recent torrents. Pamoja Society Center is south of LSU Health Sciences Center at 3806 Linwood. It is on the LSUHSC side of the strip of shops called Linwood Village. Across the street is Forest Park Cemetery. $10 per class; cash, please. Comfortable shoes and clothing, bottled water and small towel. A no-pressure, fun experience. A stress reliever. Tarama says, "Also, encourage the man or woman in your life to join us. Remember, a man and a woman will guide you through it, so it will not feel like a class, and you'll feel good about that. It will be like a fun, family get-together." Since the Davenports helped me found the Blanc et Noir Marching Society, I can attest to their integrity, reliability, artfulness and warmth. Also, they are astoundingly capable dancers. - The Band's Visit - beginng Fri - is about an Israeli Marching Band's mistaken sojourn in an Arab village. - Ending this week: Under the Same Moon and Honeydripper. - These all seem to me what we've wanted: movies made with a consciousness miles away from the commercial mainstream. - Have you eaten at Abby Singer's Bistro? Rauschenberg was one of my heroes. His playful art coupled whimsy with heart. "There is no reason not to consider the world as one gigantic painting," Rauschenberg said. At MoMA one reads, "He composed First Landing Jump out of a rusted license plate, an enamel light reflector, a tire impaled by a street barrier, a man's shirt, a blue lightbulb in a can, and a black tarpaulin, as well as paint and canvas. Jasper Johns coined the term "Combine" for such works, which he described as "painting playing the game of sculpture." In 1983 he came to my generation's attention by his design for a Talking Heads record. With Speaking in Tongues, David Byrne and partners created a great set of songs, including "Burning down the house" and "This must be the place." The design by Rauschenberg was not impressive. But that a pop art master worked with the Heads was very cool. The Rauschenberg edition of Speaking in Tongues is still in my cabinet; thus I own a Rauschenberg. My daughter Madeline made family history by taking off the plastic wrap of a record - argh - which had been put aside as a collector's item. In designing activities for students visiting the artspace exhibit Faces of Katrina, I employed a Rauschenberg collage technique. In fact, the hundreds of students and teachers who visited the exhibit were given the option of making what was called called a "Rauschenberg Collage." They were based on his Overseas Cultural Exchange works. When Kathryn Usher makes cool assemblages based on detritus from the streets of Highland, she is doing Rauschenberg from the 1950's. When you sit down at your piano to play the John Cage piece, 4' 33", you are doing a piece inspired by Rauschenberg's White paintings. "The "white paintings" produced by Rauschenberg at Black Mountain in 1951, while they contain no images at all, are said to be so exceptionally blank and reflective that their surfaces respond and change in sympathy with the ambient conditions in which they are shown," says wikipedia.org. Environmental Voter Day, featuring kickoff of the Louisiana Briefing Book, is May 19 in Baton Rouge, says Paul Orr. "This is a wonderful opportunity to meet fellow Louisianians concerned about the environment, learn about the legislative process, show our state legislators that we care about the environment and let them know that we vote. Feel free to bring friends and please pass this invitation on. Car pooling may be available for your area." Please sign up for this event and register for your lunch seat by emailing cleanenergy2008@msn.com or call Leslie March at 985-871-6695. Please provide name, email address and/or telephone number. 11:30 - Lunch at Hollywood Casino with invited legislators and policy staff and featuring the kickoff of the 2008 Louisiana Briefing Book. All participants are requested to wear business attire. "Twas quite a surprise," says Pat McCann of his recent solo performance for the rehearsal supper of the Jenna Bush wedding. All McCann knew going to The Range, a restaurant in Salado, Tx, where he plays regularly, was that the job was for someone from Virginia who had listened to his CD and liked his music. An additional surprise when the groom's mother came up to McCann as he played. She said, "T-turn it up." McCann won fans growing up in Shreveport by being a hot guitarist in rock bands such as the Warlocks, Gripping Force (you should see the photos) and Axis. In the early 70's he joined forces with Roger Barnes, George Hancock and several additional players in the quintet Heart's Island. They had a large fan base, a singular jazz/blues style, and went to California to record and experience oneness. McCann made music in Jazziana and Rue du Lac before moving to Austin. Today he plays in Stop the Truck and the Mau Mau Chaplains in addition to his solo work. Gear, you ask? Well, a Godin nylon-string electric through a Fishman amp. 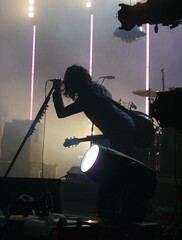 Electrically he's playing a Strat as well as a JR Beck slim hollowbody through a Fender Super Champ XD. 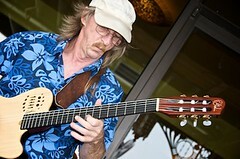 McCann plays it all, from jazz to country to RnB, but lately, he says, "I'm possessed by Django." If you can find a copy of his solo CD, "50 Years in De Nile," you'll love it. Dirty Red Crenshaw is a trumpeter who understands music, tone, groove, poetry, melody, professionalism and, supremely, the birth of the cool. Having Crenshaw accompanying the Bluebirds at the Barnwell Center makes the Thursday night event a sweet deal. You may think of Bruce Flett as a purveyor of blue-eyed soul, and he is, but he is much more than that. Loves the challenge of jazz. As do his young podnas, Jimmy Wooten and Cody Lowery. 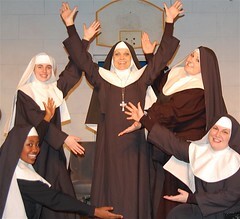 "We've got additional performances of Nunsense on Sat and Sun," said Anne Susman of the Bossier Arts Council. "But there's no performance Friday night because the youngest sister, Jessica Maxey, has her high school graduation that night. She's finishing as valedictorian of her class at Loyola." Reagan Cassanova, Sister Mary Robert Anne. Sat, May 17, 8 pm. Sun, May 18, 2 pm. 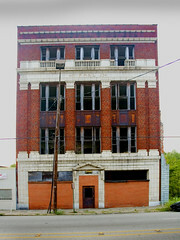 East Bank Theatre, 630 Barksdale Blvd. in Bossier City. $15, adults; $11, students, seniors and active military. Picnic pops weekend: Michael Butterman will lead the Shreveport Symphony Orchestra in a concert at Riverview Park on Sat, May 17. The music will boom, purr and roar. Butterman's baton will slash the air at 7:30 pm. The SSO will be joined by the ArkLaTex Youth Symphony under the direction of Chris Allen. See photos of the Youth Symphony rehearsal at ShreveportFaces, please. The photo above is of the SSO playing under the banner of Opus, the new player's association, in a pops show presented at La Boardwalk. Opus represents the musicians reaching out to the public and trying to build enough support to, ultimately, save the core players and the SSO itself. 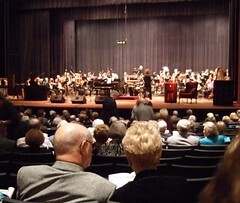 Those who want to contribute to the orchestra's decimated financial base may contribute to the annual fund atthe SSO. And, because of the nature of extended negotiations, it is possible that OPUS is building a fund. OPUS has a new Audience Association, too. Thanks to Susan Rogers for photo and background. A photography exhibit called In Memoriam opens Thurs, May 15 at 5:00 pm, at artspace, says Pam Atchison. Artists Steve Roell and Scarlett Hendricks explore memorials: Roell’s work considers Roadside Memorials. Hendricks’ photos explore “Gallic Ghosts,” French Cemeteries from Paris to Provence”. The In Memoriam exhibition opening is held as part of the free third Thursday Trolley Night: TNT Express: An Explosion of Art and Culture in Downtown, Shreveport. There will be entertainment by Diedre and Bob, refreshments, and a trolley tour that takes guests around the 15 cultural destinations in the downtown area providing a “sampling” of the cultural venues. No charge at all, says SRAC. 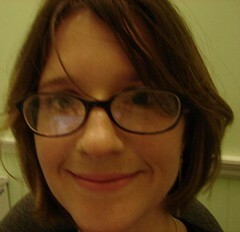 "I am almost done with all coursework at Tulane for an MA in musicology. Entering the pure research phase," writes Kathryn Hobgood. Only a couple of years ago Kathryn, aka Katy, was singing her songs in local venues and writing articles on local musicians for SB and other publications. "I have been researching, for about a year and a half now, a great uncle who was an obscure jazz guitarist named Snoozer Quinn. career, 1924-1933, and I hope to come home for an extended period to do some archival research. Have you ever heard of Snoozer? He played with Paul Whiteman briefly in 1928-1929, and he was at the Washington-Youree hotel with Peck Kelly and other bands in the early 1920s. The Shreveport Musician's Union Hall has a beautiful photo of Snoozer Quinn and Louis Armstrong standing together in Princess Park (c. 1931)." and writers John Andrew Prime and Eric Brock, as well as others. If you've got something on Snoozer Quinn or local music in the 20's and 30's, please email her at hobgood.kathryn@gmail.com. John Grindley passes on this opportunity concerning Microwave Park, the Millennium Films feature film directed by Charles Winkler and starring Val Kilmer, 50 Cent, Sharon Stone, and Michael Biehn. The production is in immediate need of an editing intern. Los Angeles, says Brooke Lehman. 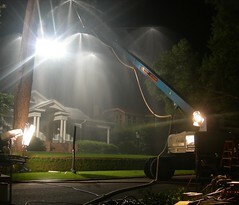 She says, "This is a unique opportunity as the feature films shot in Shreveport are almost never edited in Shreveport." previous experience is required but intern candidate MUST be available to work long hours and be reliable. We are offering a stipend of $50 per day. 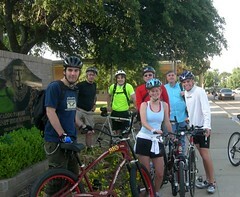 The League of American Bicyclists is promoting Bike-to-Work Week from May 12-16 and Bike-to-Work Day on Friday, May 16. Last year a number of teachers and students biked to Caddo Magnet High on the big day. We started in the parking lot at Starbuck's, Line Ave.. A similar group biked to Montessori School for Shreveport. There were probably other bike treks going on unbeknownst to me. This year there's a group of bike-minded people coalescing at meetings led by Loren Demerath and Maurice Loridans. Demerath's blog for A Better Shreveport will show you that plans for how best to encourage simple bicycling in Shreveport are under way. One plan is to host a bike clinic to encourage people to dust off, air up and wheel out their rarely-used cycles. if you enjoy city biking, please get in touch. It's hard not to say that the time's right. a) Begin your trek early so as to minimize traffic hassles. Most of Shreveport does not seem to hit the street in cars until about 7:40 am. b) Helmet hair? Sweat? Nah, you're not going to be riding. I pack a change of shirt and trousers and a towel. c) Ride home between the major waves of traffic. In East Shreveport there is a sweet spot from about 4:05 to 4:45 when the streets are bizarrely empty. The Academy of Children's Theater production of the classic Sound of Music is a mesmerizing show because the young singers are so capable: they're tuneful and graceful and are clothed in terrific costumes. - Thurs through Sat the show starts at 7:00, and there is a matinee Sun at two o'clock. - Call (318) 869-5242 if you would like to order tickets or for any other questions concerning tickets. - Tickets are $20 for students, children, and seniors. $25 for adults. - Running time, about 2.5 hours. 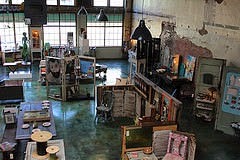 - See a review in Shreveport Blog last week. Any interested actors please contact Ryan Williams, director, at ryanwilliamscmm@yahoo.com. Blocking rehearsals begin June 9. Drink, dine and dance the night away to the sounds of the Shreveport Symphony, says the invitation; it's the annual orchestra event called the Constellation Ball. If you attended the Radio Days SSO concert in October you know that big band music, deriving some of its power from massed horns, is an orchestra specialty. 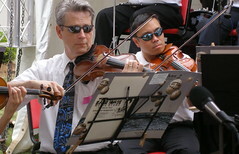 This ball is one of the orchestra's major events in raising funds. The Bluebirds with special guest Deidre will be playing at Jayne Marie on Cross Lake Sat, May 10, from 7 to 11 pm, says Bruce Flett. Next week The Bluebirds(Bruce Flett, Cody Lowery, Jimmy Wooten) will be entertainers at the Thurs Hot Jazz on the Red series at the Barnwell, on the Riverfront. That's May 15, 6 to 8 pm. Next Fri, May 16, they're back to Jayne Marie on Cross Lake. Look for the Bluebirds Sun, May 25, at Mudbug Madness. They will be on the Swamp Stage. Visited Jayne Marie recently and found it very comfortable. Parking's easy and safe. While I didn't have time to have supper, I noticed that restaurateurs Jimmie and Jackie Caskey, of Jacquelyn's, were happy with their meal. It didn't arrive quickly, but it was nicely presented. The dining room's view of the lake is romantic. Acoustics were such that the band played, we chatted without undue effort, and finally, we cut a rug in front of the band. A satisfying evening, certainly. Where will the the Shreveport Symphony Orchestra find the funds to keep the full orchestra alive? There's no easy answer to that question, but negotiations have not closed. And the orchestra players are trying to make sure that area audiences are aware of the musical performances that are at stake. 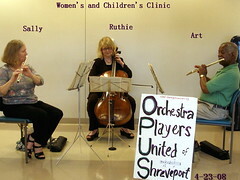 OPUS (Orchestra Players United of Shreveport-Bossier) will produce a pops concert Saturday afternoon, May 10, 3 pm, in Bossier City, on Louisiana Boardwalk's 3rd Anniversary. The musicians of the SSO / OPUS will be performing a pops concert under the baton of Kermit Poling, says Susan Rogers. The concert will be held near the Cumulus end of the Boardwalk. There's an alternate site nearby in case of rain. A new Symphony Orchestra of Shreveport-Bossier Audience Association has been developed, says Rogers. 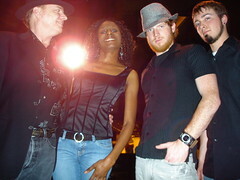 The group's principal goal is preservation of the full time Core Musicians. It is a 501-c-3 organization, says Rogers. - the Constellation Ball, Friday, May 9, at Sam's Town Grand Ballroom. It features cocktails, a seated dinner, auction and dancing to the orchestra in big band mode. Tickets are $150. Please call 227-8863 to support the SSO via the ball. - the Picnic Pops Concert at Riverview Park on Sat, May 17, 7:30 pm. Project Talent gathers some of the best and brightest of Caddo teens in an after-school program under teachers Marabella Dunn and Shirlene Alexander. They draw and paint, use the computer and books, and make terrific art, says Henry Price. Students and parents will gather for a reception marking the opening of their annual show at LSUS University center Gallery on Wed at 7 pm. 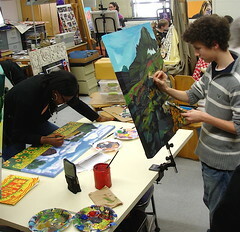 Some of these students may well be be the art stars of the future. Murder at the Banquet is a bawdy interactive comic murder mystery directed by Pruitt Taylor Vince, says Robert Alford. Encore Performances have been scheduled May 9, 10 & 11 at 8 p.m.
Nine Inch Nails founder Trent Reznor released a 10-track, 43-minute studio recording, “The Slip,” through his Web site, nin.com, on Monday. It was made available for immediate download in four digital configurations, each of them free, says Chicago Trib music writer Greg Kot. “Thank you for your continued and loyal support over the years - this one's on me,” Reznor wrote on the Web site shortly after midnight as he made the music available. He encouraged downloaders to share and remix tracks. A CD and vinyl version of the album will be made available in July. “The Slip” represents the fifth set of new material Reznor has released this year. In March, he released a four-volume set of instrumental music, “Ghosts I-IV,” through his Web site, at five different prices, including a free download of some of the tracks. After a week, he reported more than 700,000 orders and downloads, and revenue of $1.6 million. Says Peter Kirn at createdigitalmusic.com, "NIN has used a Creative Commons attribution / non-commercial / share alike license, so you can remix their track for non-commercial purposes, free." process, says Paul Orr of the La Dept of Enviro Quality. The goal is for communities to become informed participants and skilled on how to access and utilize informational resources for effective communication and dialogue with stakeholders. The New Dimensions Brass Quintet plays on the Barnwell patio Thurs, May 8, says Freda Powell. They are the second in the Hot Jazz series at Barnwell Garden & Art Center, 60 Clyde Fant Pkwy., Shreveport. ElDorado Resort Casino sponsors the concerts from May 1 to June 26, every Thurs, from 6 to 8 pm. Thus, no charge. 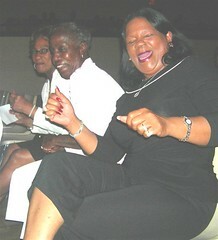 The New Dimensions performs annually at the Revel and other fests; I've learned to go immediately to their stage. Their sound is smartly modulated, their material well chosen (Beatles, etc) and the overall impact is distinctly uptown. 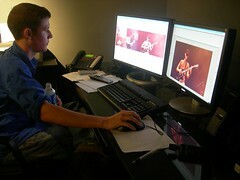 The Robinson Film Center Exhibition Schedule can be found on-line, at sites like Yahoo Movies, says Chris Jay. They will also be available on the new RFC website when it debuts later this month. Another place to keep up with the films: ShreveportBossierFunGuide.com. A documentary film about the eternal power of art, as embodied by a cemetery where many of history’s greatest artists are buried. Each month West Edge Artists Co-op highlights artists' lives, writes Danielle Reans. 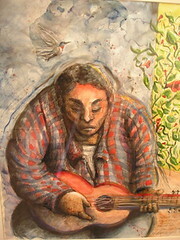 On Sat, May 10, the artists are Beverly Bryant, Debbie Buchanan Engle and Sheila Todd. 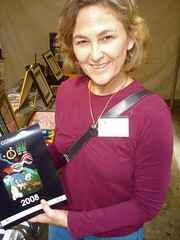 Beverly Bryant has been an artist all her life, and aspires to create art everyday. Debbie Buchanan Engle’s art and life intertwine, and her art reflects this. Sheila Todd’s work with the Volunteers of America has been the inspiration for its Red River Artists with Disabilities (Rrad) Program, and Sheila is at the heart of this program. There will be time to mingle and network as well as a formal presentation by the artists, showcasing their work. Robinson Film Center opened with an ultradiluvian upbash this weekend. Now it's time to see movies in the two theaters and sample the sushi, etc, at Abby Singer's Bistro (I shall let them tell you about the name). During the packed weekend opening I was chatting with a downtown professional who said, with a sigh, "There's just no place to eat downtown." Inasmuch as we were peering at Texas St from the Abby Singer Bistro balcony, I was gentle in explaining that he could now eat at the Bistro during lunch, afternoon, supper, etc. And didn't need to see a movie to enjoy a meal. 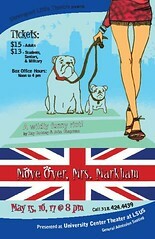 Move Over, Mrs. Markham, a British comedy, will be staged May 15, 16, 17 at 8 pm in the University Center Theater at LSUS, says Bobby Darrow. Darrow and Shreveport Little Theater have another production with what seems to be almost a repertory company: actors Joe Todaro, Michael Blake Powell, Josh Talley, Jamie Norwood, Virginia Walker, Haley Young, Lisa Daye, Valerie Perdue, and Dana Volkmar. The production crew includes Josh Talley, Mike Jarrett, scenic construction, David White, lighting design, Charles Stewart, wig design and David Anderson, sound design. $15. for adults, $13. for students, seniors, and active military. Box office noon to 4:00 p.m., 424-4439. 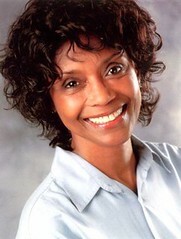 Academy Award nominee Margaret Avery will be starring in River City Repertory Theatre's upcoming production of "The Member of the Wedding." The production opens July 16th and runs through July 20th at the Scottish Rite Cathedral in downtown Shreveport, says Patric McWilliams. Avery will be playing the role of Berenice Sadie Brown in the Carson McCullers play. "Wedding" depicts the lives of whites and blacks in the South during the 1940s and the turmoil of twelve year old tomboy, Frankie Adams, as she awkwardly enters adolescence. Berenice, who works in the Adams household, has become a surrogate mother to the young and motherless girl. 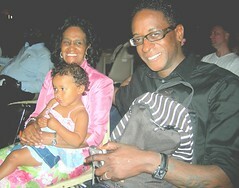 Avery was nominated for the Oscar in Steven Spielberg's, "The Color Purple" for her performance as Shug Avery, the jazz singer. Currently, Avery can be seen in two films: "Welcome Home Roscoe Jenkins" and Tyler Perry's "Meet The Browns." Avery has won a Los Angeles Drama Critics Award and a NAACP Lifetime Achievement Award. The play will be directed by Patric McWilliams, Artistic Director of River City Rep; he will also design the sets and costumes. Tristan Decker will be the Light Designer and Kermit Poling will compose original music for the production. The stage sisters starring in the irreverent Nunsense at East Bank Theater, Bossier City, have gotten a detailed thumbs up from Times writer Alex Kent. Sun, May 11, 2 pm. One of the newest features of Artbreak is the Bossier Arts Council's Artbreak Idol contest. On Sat, May 3, at 6 pm see the Broadway Night Semi-finals. This show stopper, says Haley Young, will feature a choreographed performance by the top 25 singers chosen from among hundreds who auditioned, who will then vie for a place among the top 3 singers in Sunday’s finals as they compete for a $1,000 grand prize. At 2 pm Sun, May 4, the Artbreak Idol Final Round hits the stage; it will feature the Top 3 singers from Caddo and Bossier Schools. 12:30 pm: The Shreveport Junior Symphony performs under the direction of Chris Allen on the Chase Bank Stage. 1:30 pm: Survivor ArtBreak contestants showcase their talents as demonstrated in the competition on Saturday. Watch as the winner is announced during the Awards Ceremony. 2:00 pm: ARTBREAK IDOL Final Round featuring the Top 3 singers from Caddo and Bossier Schools. 3:00 PM: ArtBreak Awards Ceremony – presenting cash awards and savings bonds to the outstanding Literary, Music, and Visual Artists in Caddo and Bossier Parish Schools followed by the announcement of the $1,000 ArtBreak Idol Award winner. 6:00 PM: ArtBreak Festival Closes. Please see an earlier SptBlog post on parking. Opening with gorgeous a capella singing in a Latin mass, adept voices drive the production of Sound of Music by the Academy of Children's Theater, Shreveport. Cynthia Whitaker, director, and Lauren Ross, choreographer, have drawn remarkably melodious performances from a cast of 50, nearly all of them youngsters. Bridget Winder plays Maria with aplomb. Her smile and capable voice, her graceful movement and appealing profile allow the audience no doubt that a young star is coming into her own on the Marjorie Lyons Playhouse stage. 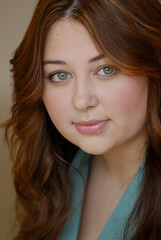 Ella Watkins, as the teen girl in the Von Trapp family, is also impressive in voice and grace. She, too, has a light-up-the-stage vibe. Academy of Children's Theater has become a cultural incubator in these several seasons. Drawing talent from across the region, Whitaker and Ross have established a high standard for talent, energy and detail. Example: you'll hear an additional song in the stage version of Sound of Music than are in the movie. Sound of Music is not an easy sell in this material world. As handsome as is the cast, the songs are classics of heart-tugging melody and harmony; they do not rock. The costumes (Nora Moon, Cynthia Whitaker) are rich of design and fabric; they are also demure. 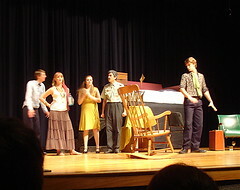 The production ran from 7 to 9:35 on Friday night; that's a bit long for the modern world. But there's a 10-piece orchestra below the stage, not a CD. And the lighting (Courtney Gaston) and sound (Adam Boyd, Ed Taunton) are unusually effective. Casting is first-rate. Even the cast of nuns have big, beautiful eyes to match their well-trained voices. John Peyton Pou is a kid who looks totally at home singing and dancing. Christian Dantes is also impressive. Backing Winder and Watkins are delightful Meagan Tinsley along with Meagan Crews, Brooke Reedy and drama princess Lucia Boyd. It's a huge cast but it has depth: Jenny Taunton and adept comedian Tyler Northen add zest to the second half. Holt Kirkrndoll, the young Nazi, was terribly smooth in both dance and song. Mike Martindale is a very capable captain. This show is a vocal feast that meets the highest standards in children's theater. 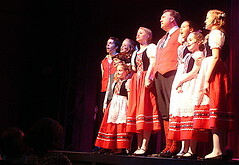 Do not hesitate to spend an evening with this Von Trapp family. - Thurs through Sat through the May 11 weekend at 7 pm each night. - Matinees at 2 pm both Sundays. 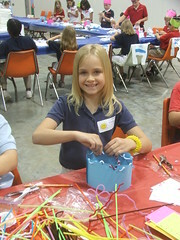 of art by students - that it needs to be housed in the biggest site in town: The Shreveport Convention Center. May 4, says Julia Foley. Admission to ArtBreak is free; there is plenty of free parking surrounding the Shreveport Convention Center; there is a free “Yellow Bus Trolley” transporting festival-goers from the AmSouth Bank Parking Garage to the Shreveport Convention Center. Those who wish to park in the Shreveport Convention Center Parking Garage located between Spring Street and Market Street at Caddo Street will pay $3.00 per car to park. Kid Friendly menus and pricing will be found in the concessions booths, says the Shreveport Convention Center. 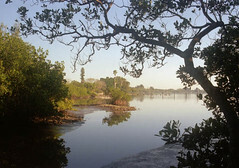 "Landscapes & Cityscapes" is an exhibition of the photographic works of Bob Wood at Karpeles Museum, says Jean Glabus. positions as a technical writer, a managing editor for a database and a real estate appraiser. 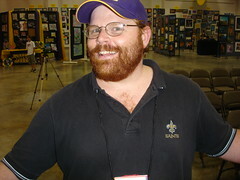 In 1992 he earned a master's in Library and Information Science at Louisiana State University, and in 1993 he began working as a reference librarian at the LSU Medical Center, now the Health sciences Center, in Shreveport. Wood's reception is Sat May 3rd between 1 p.m. and 3 p.m.